The Hollywood Foreign Press embraced Baz Luhrmann’s one-of-a-kind musical like no other, and their support catapulted the movie to box office heights and an Oscar nomination for Best Picture. The film had many adherents among them Robert Wise and Stanley Donen, who proclaimed that director Luhrmann had reinvented the Hollywood musical. The National Board of Review called it the best film of the year, and Time magazine, the worst movie of the year. It certainly divided audiences. But then, after it won the Golden Globe for Best Musical or Comedy and the Producers Guild gave it its Best Film of the Year Award, it became a serious Oscar contender. Fortunately, in the opinion of many, better minds prevailed and A Beautiful Mind won. 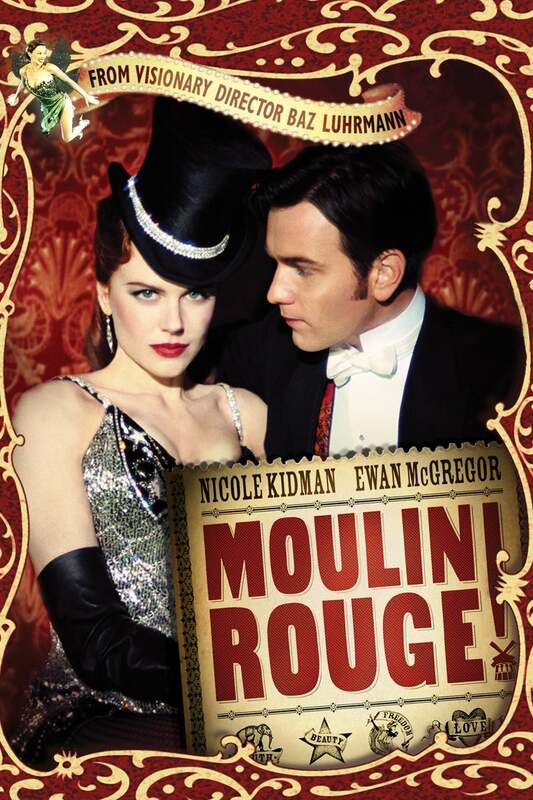 In the Special Edition of the film’s DVD release, Luhrmann explained what he was trying to do: “The whole stylistic premise has been to decode what the Moulin Rouge was to the audiences of 1899 and express that same thrill and excitement in a way to which contemporary movie-goers can relate." To do so, he borrowed extensively from the Hindi movie China Gate, then added Queen's "The Show Must Go On" (arranged in operatic form), David Bowie's rendition of Eden Ahbez's "Nature Boy”, Christina Aguilera/Pink/Mýa/Lil' Kim’s cover of Patti LaBelle’s “Lady Marmalade,” Madonna's "Material Girl" and "Like a Virgin", Elton John's "Your Song", Rodgers and Hammerstein’s “The Sound of Music,’ "Roxanne" by The Police and even "Smells Like Teen Spirit" by Nirvana, the latter the result of Courtney Love having once been considered for the lead, which eventually went to Nicole Kidman. It took Luhrmann almost two years to secure the rights to the songs, and audiences ate it up. Nicole Kidman won the Golden Globe for her performance in the film, for which she received an Oscar nomination as well. Her Golden Globe competition was Thora Birch for Ghost World, Cate Blanchett for Bandits, Reese Witherspoon for Legally Blonde, and Renée Zellweger for Bridget Jones’ Diary. Golden Globe nominees for Best Actor in a Musical or Comedy were Nicole’s costar Ewan McGregor, Hugh Jackman in Kate & Leopold, John Cameron Mitchell in Hedwig and the Angry Inch, Billy Bob Thornton in Bandits, and the winner, Gene Hackman for The Royal Tenenbaums. Steve Buscemi in Ghost Story was the lone Comedy supporting nominee. Moulin Rouge’s only original song “Come What May” was nominated by the HFPA, but it was disqualified by the Academy because it had been written for Luhrmann’s previous extravaganza Romeo and Juliet. Sting’s “Until” from Kate & Leopold won the Golden Globe but the Academy went with Randy Newman’s “If I Didn’t Have You” from Monsters Inc. Not a particularly memorable year for musicals.